CMS Blogger - Congrats on the PR (over 2 minutes) with the 2:21:39 (5:25 pace), 72nd place overall at the California International Marathon (Sacramento, CA) on Sunday. How were the legs after the Baystate Marathon (4th place, 2:32:45 in Lowell, MA on October 21, 2018 – 43 days ago) and what was the goal for CIM? Scott – The legs were a little beat up after Baystate but that was the plan going into it. I used it as a long marathon-specific training run/workout after a long training buildup over late summer/early fall. 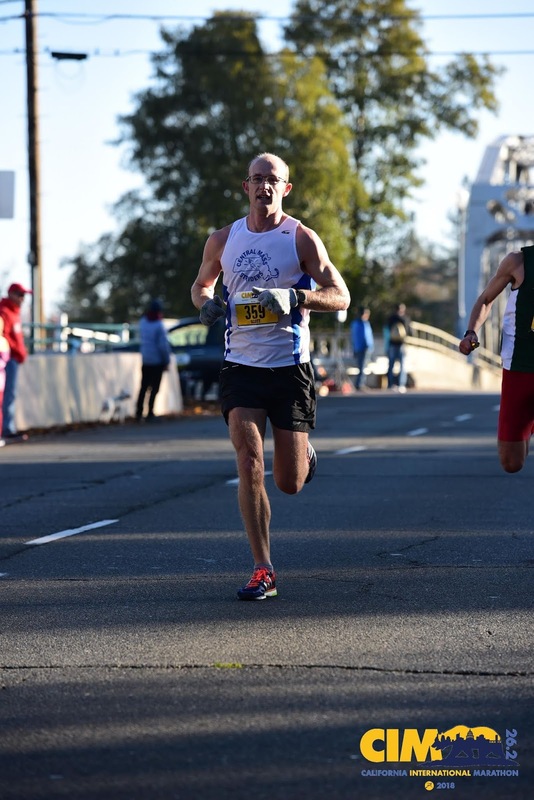 The goal going into CIM was to at least try for a new PR (2:24:00 or better). My training lead up went well but I wasn’t shooting for any specific time having never run the course. CMS Blogger – when did you put CIM on your calendar and what was the drive behind it? Scott - It was on my radar after I saw the 2017 results from some east coast guys start trickling in on Strava. It was just a thought but nothing more than that until I started planning out the fall racing schedule and a fall marathon. I think I “officially” committed somewhere in mid-August. I wanted to get in a fast marathon and heard and read good things after the 2017 race results came in and I started digging into it more. I also heard rumblings that some local NE guys might be heading out there for 2018 so that put a little more coal on the fire. CMS Blogger – You ran a negative spit in the second half (1:11:17/1:10:22) and Brandon Newbould noted that split was your 2nd fastest 13.1? Truth and thoughts on that? Scott – It depends on what you consider an official 13.1 result :) Race-wise my fastest HM was New Bedford from this past March (1:10:23). In a few past fall marathon tempo-effort build-up runs (including this year) I’ve clocked faster times over 13.1 but those were GPS miles (most-likely short) and run on fairly downhill courses. I don’t take those times too seriously, I use them more as a barometer of current fitness level. Certified distance race results are what I’d consider “official HM times.” The fact that the 2nd half of CIM was that fast was a little unbelievable though. CMS Blogger – with the PR, what was different in the preceding 12 months heading into CIM? Scott – I’d never planned for a serious late-fall/early-winter marathon this late into the year before. The first couple of months of 2018 went pretty routine in terms of training for a spring marathon. I went out to Carmel, IN (2:24:46) to try another fast course in late March then took some time off and went on vacation. Because I hadn’t committed to CIM until mid-August I had a pre-emptive marathon build up that I had to cool off to account for the goal race date push out from October to December. Everything else went as normal as I would call it for a training cycle. CMS Blogger - just like in many New England Championship races, you had CMS teammate, Dan Vassallo (ran 2:17:27) at the starting line with you. Did you guys discuss the event in advance? Scott – I had heard through the grapevine in June/July that he was thinking about going out. Around the time that I was committing (mid-August) I talked to him (after the NH 10-miler) and he said that he had committed as well. There were some on and off discussions post-race over the summer but nothing too serious. We both ran Baystate as a hard training run but did meet up for a long tempo effort over a difficult course together in early November. Dan’s an animal when it comes to the marathon and I knew he was going out to CIM on a mission for an OTQ. I knew if I was “only” a couple of minutes behind him during those workouts then my training wasn’t going too poorly. CMS Blogger – have you run a US National Championship before (50K roads)? What were those events and results? How was this Championship different compared to those? Scott - I did jump in to the USATF 50k road championships back in 2012 (4th) & 2013 (3rd) out on Long Island. Those events were much more low key than CIM in all regards (attendance, crowd support, etc). It was a 5k paved park loop that you ran 10 times in a row. Joe Gray was dominating those events but the ultra distances in general seem to draw a much more relaxed crowd that’s out there to run and enjoy the experience. CIM was a much more serious event with people running for a specific purpose and looking to get a fast time. It was a night and day differences in running culture. CMS Blogger – did you do anything interesting while you were in California before or after the race? Scott – I didn’t have a ton of vacation time to burn so my wife and I flew out on the Wednesday before and flew back on the Monday after. With flying, the expo, previewing the course, etc. that only left one full day before hand to do some easy sightseeing and that’s about it. We went out to the Sierras and South Tahoe to see some sights but nothing crazy. Just some easy walking around. It was good to see the area but it would have been nice to take some more time afterwards to relax and not worry about getting in a run or resting my legs. I give my wife a lot of credit for putting up with all of my “requirements” when we do any destination marathons. CMS Blogger – anything amusing or had you cracking up during the race? Scott – No funny anecdotes about signs or spectators or anything. The funniest thing was just the number of Northeast/New-England guys that I saw out there. A perfect example was running in an early pack and thinking that one of the guys in our group kind of looked like Eric Blake but I didn’t say anything to him, I was just focused on running my race. In my mind it could have been anyone and he didn’t have on any NE-specific running gear that I could recognize. He turned to me at mile 10 or so and said something to me by name and I knew that it must have been him. We ended up running together until mile 23 or so. Post-race I probably saw another 6 or so past/present NE guys that I recognized and talked to that I had no idea were going out to run CIM. CMS Blogger – what is next and plans for 2019? Scott - Time off from any serious running for the time being. CIM was a long build up and I usually take some time to decompress after a marathon training cycle. Maybe some late-season indoor track stuff but I’m not too concerned if I miss out on this season. After seeing the time that I ran at CIM I’d like to take a crack at a marathon OTQ but the window for that is shutting very quickly.